We've all been there. Suddenly your head feels as if it weighs more than your body. Then, using every ounce of strength you can muster, you somehow manage to keep your eyes from shutting and your face from smashing into your keyboard. Ahhh, the good, ol' mid-afternoon slump. Aside from poor sleeping habits, inactivity and anxiety, certain foods (including anything processed or high in fat or sugar) can also zap your energy levels. And while there are countless perks to drinking coffee, other foods can also help give you a boost throughout the day. 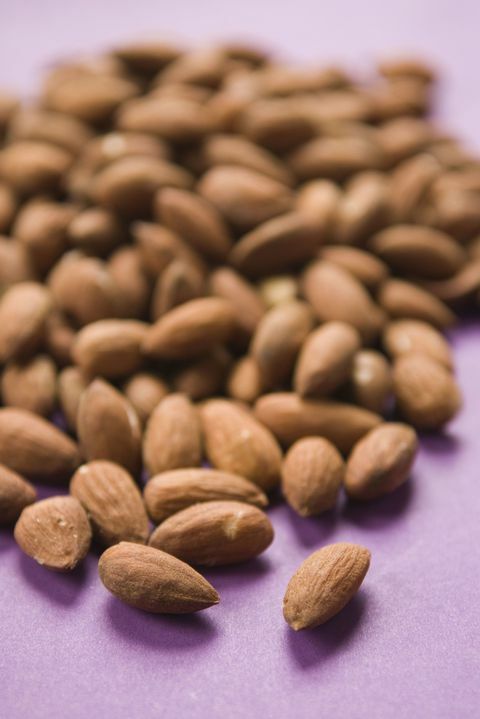 "Energy boosting snacks are ones that combine at least 3 to 4 grams each of filling fiber and protein," says Jaclyn London, M.S., R.D., C.D.N., Nutrition Director at the Good Housekeeping Institute. She also recommends loading up on fruits and veggies. "Often, we find ourselves in the middle of an energy slump thanks to dehydration, which is a sneaky culprit of sleepiness, London says. "Add an extra serving of veggies or fruit to meals to make sure you're staying hydrated from food and drink." "This green tea powder is having a moment!" says Frances Largeman-Roth, R.D.N., author of Eating in Color: Delicious Healthy Recipes for You and Your Family. The dried leaves become part of the drink, adding more antioxidant benefits than brewed teas, she says. The stimulant effect comes from naturally occurring compounds, but an 8-ounce cup has half the caffeine of coffee, Largeman-Roth explains. 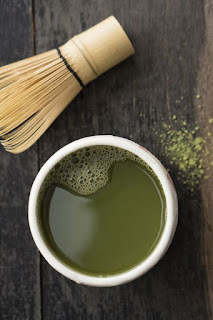 If an afternoon cup of joe prevents you from sleeping later that night, matcha could help. "Just don't go for the sugary latte versions that have become popular," she warns. A concentrated powder form is your best bet. "Water is always wonderful for hydrating, and sometimes we actually mistake mild dehydration for hunger," states Largeman-Roth. Drinking H2O — especially before thirst sets in — can actually lead to better concentration and performance, according to a small 2013 study published in Frontiers in Human Neuroscience. 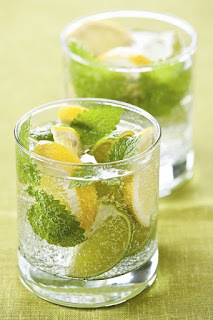 "Citrus and peppermint will give an extra perk to regular water since studies show that both scents can make you feel more energized," Largeman-Roth adds. In addition to providing satisfying protein, almonds also contain lots of magnesium, says Largeman-Roth. "This mineral is essential to 300 biochemical reactions in the body, including blood glucose control and energy production," she explains. Also, this healthy "good fat" snack is packed with B-vitamins that help convert food into power, as well as energizing nutrients copper and phosphorus. Also, don't worry about the effects this raw snack may have on the scale. Almonds contain about 20% fewer calories than originally thought:129 calories for a 1-ounce serving, according to 2012 study in the American Journal of Clinical Nutrition. Yes, we saved the best for last! 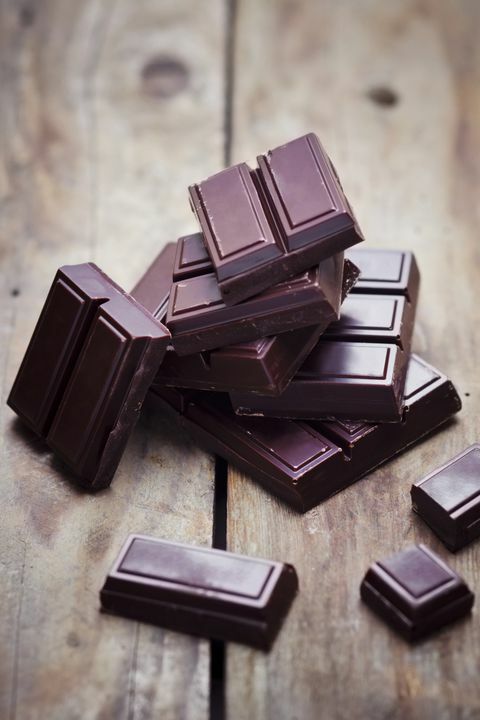 Thanks to the cocoa flavanols in this decadent treat, chocolate now counts as brain food. Drinking cocoa beverages every day for eight weeks led to "significant improvements" on tests that measured memory, attention and executive function in a 2012 study in the American Journal of Clinical Nutrition. "Just don't eat an entire bar!" warns Largeman-Roth. "Even a small serving can provide a benefit." For a nutritious wake-me-up snack, she suggests nibbling on 1 ounce of dark chocolate or sprinkling cocoa nibs over a Greek yogurt.